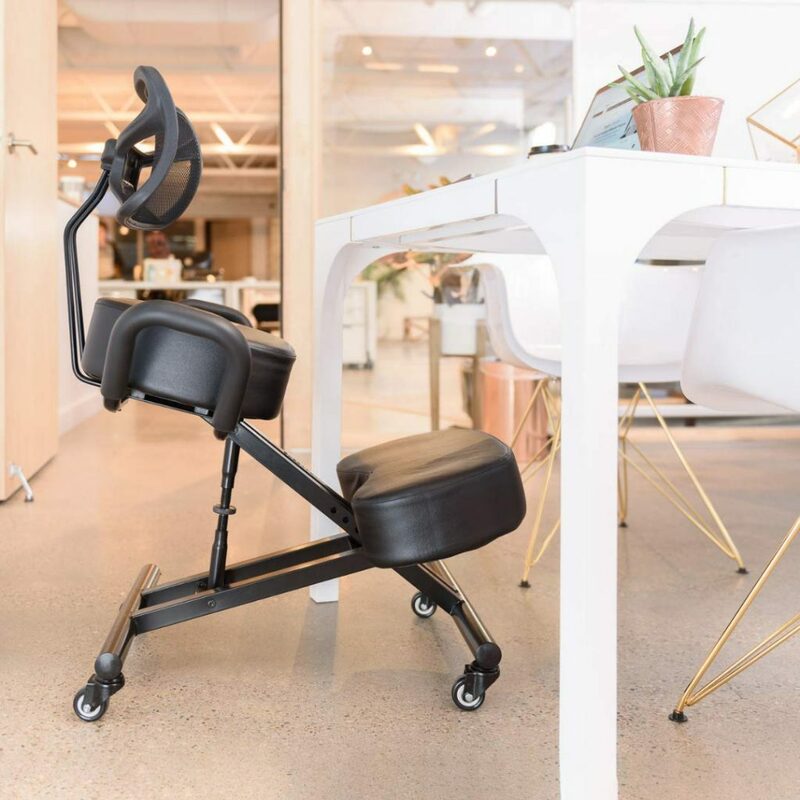 Having back pain, but don’t feel like standing but want to try something new at work? Perhaps you can consider looking into a kneeling chair. When kneeling correctly, you can gain some benefits of fixing your posture and helping put off pressure on your lower back when sitting. 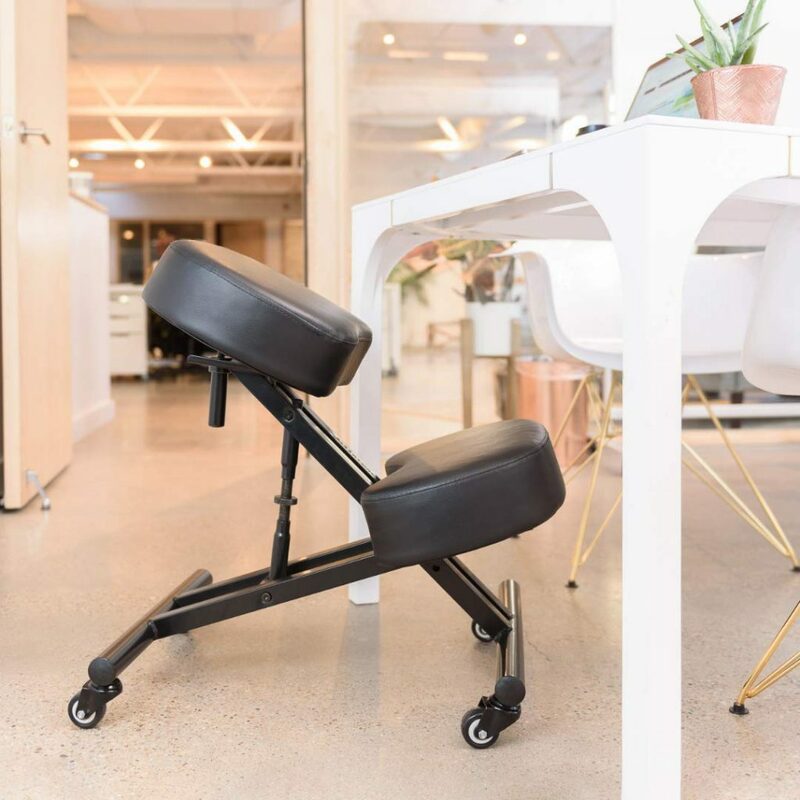 The first kneeling chair was developed about 40 years ago, and since then have gone through numerous iterations to fit the majority of office workers today. With a simple Google and Amazon search, you’ll see hundreds of different kneeling chairs. This article is to get you to understand everything about kneeling at work from the purposes of kneeling to the best kneeling chairs. Will kneeing chairs hurt my knees? Should I stand or kneel at my desk? The main purpose that these kneeling chairs have become popular is because it reduces lower back strain. It does so by dividing the burden of the weight between the knees and the buttocks. A proper way of sitting on a kneeling chair creates the open body angle by lowering the angle of the lower body, thus it helps by keeping the spine in alignment and the sitter properly positioned to sit up straight. The benefit of this position is that if one leans inward, the body angle remains 90° or wider. Comes with four rolling wheels so it can easily be maneuvered throughout your home or office. 2x more cushion giving more comfort for the buttocks and knees. Cushions are made from 100 percent recycled foam. Allows you to rock forward. Built with 4 wood cross timbers for durability. Uses 20-ply for strength and durability. Can hold up to 250lbs. 4.5” thick cushions instead of 3” cushions. 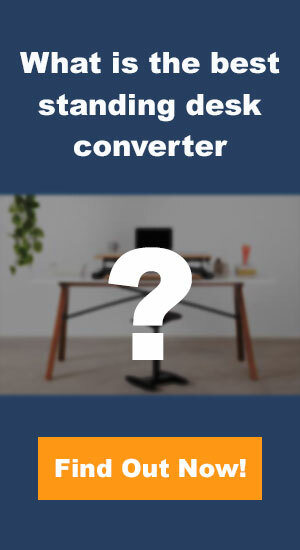 Sets up in less than one minute – very little assembly. 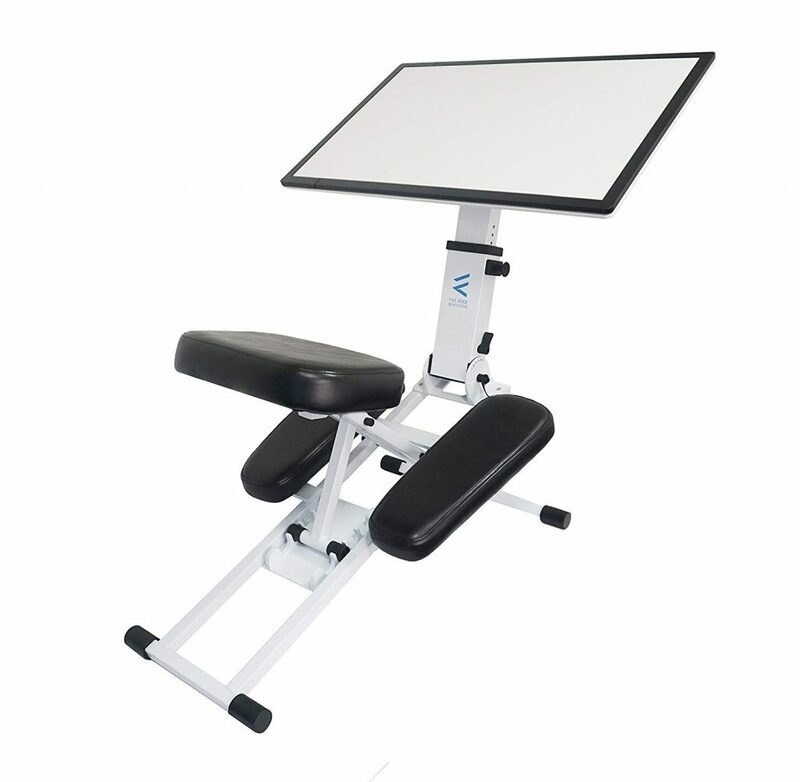 Adjustable kneeling chair with a work surface that adjusts from a flat desk to a raised easel. Ability to fold the desk down to just six inches high to save space for portability and storage. Weighs just about 28 pounds. The desk can support a maximum user weight of 250 pounds and a height of 6 feet 2 inches, with a maximum desktop load of 15 pounds. The desk comes fully assembled and measures 20 inches wide, 40 inches long, and 6 inches tall when folded up. Has wheels for easy maneuvering. You can adjust the stool to a size that fits your personal needs, anywhere from 22.4 to 29.7 inches. Works best for heights 5’4″ and above. 90 days guaranteed or money back. 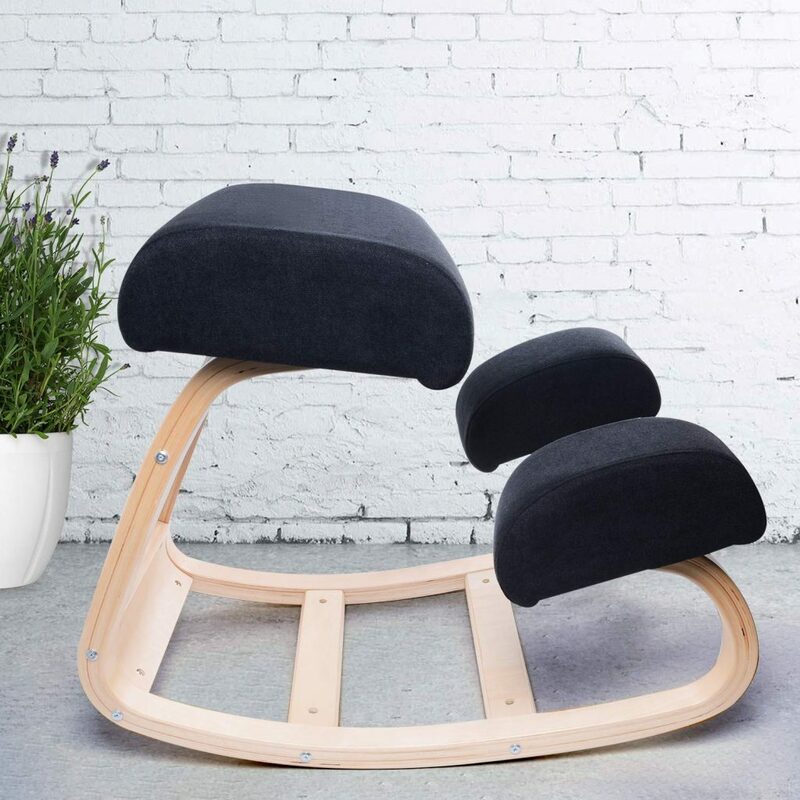 You’ve gone through the best kneeling chairs and its purpose, but there are some benefits that you might want to take a look at to solidify your decision in purchasing one. It helps with the core which helps to build strong abs! You can place one leg forward while kneeling on the other leg. This places your spine and pelvis in a more neutral position than sitting or standing. Kneeling chairs places your body in a natural position. Helps you to stay upright, reducing stress on your spine. Because it helps with the core, it improves endurance in your muscles. Encourages you to move throughout the day. Poor range of motion, where you’re only limited to certain body adjustments. Kneeling chairs aren’t built with the best quilty. Most kneeling chairs aren’t good for tall or big people. There are little adjustments that you can do in kneeling chairs. A misconception regarding kneeling chairs is that the body’s weight bears on the knees, and thus users with poor knees cannot use the chair. In a proper kneeling chair, most of the weight remains on the buttocks, and some of the weight bears on the shins, not the knees. The primary function of the shin rests (knee rests) is to keep one from falling forward out of the chair. Both standing desks and kneeling chairs have their pros and cons, but they both work in different ways which we’ve highlighted above. Adjustable desks have a lot of health benefits too but can often cause some people to be more tired on their feet. One thing we recommend is to try both and see what works best for you. Both are great ways to help you stay moving and fix posture and sedentary lifestyles.